Here are just 4 of my numerous cables, neatly labeled using Diy Kableflags. Well, okay, the handwriting on the labels isn't all that neat; I had trouble writing neatly with my Sharpie marker on these rubbery labels. But I can easily tell at a glance which cable is for my iPhone, my Garmin Nuvi, my camera (a Panasonic Lumix), and my Kindle Fire. 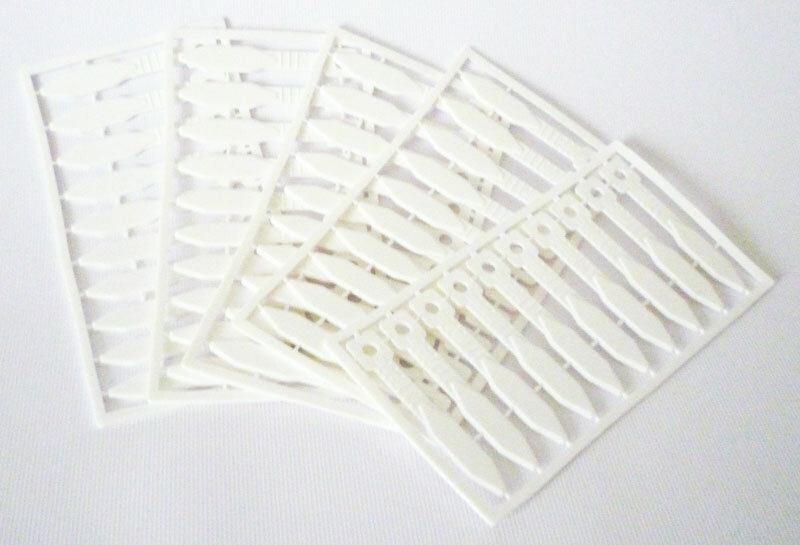 The Diy Kabelflags come in sheets of 10. The 50-pack I bought has 5 sheets of 10, as you can see above. Besides the nightmarish tangle of cords behind my computer, I've got a bunch of cables and cords for various electronic devices. There's the USB cable for my camera. 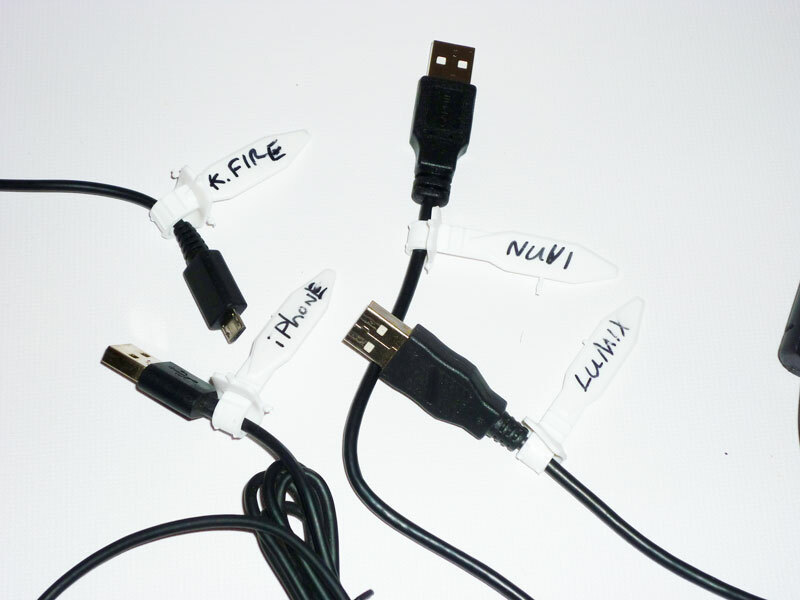 USB cables for my Kindle & my Kindle Fire. USB cable for my iPhone, plus car charger for my iPhone. USB cable & car charger for my husband's iPhone. The A/C charger plus a car charger for my handheld VHF radio. USB cable for my husband's camera. USB and Firewire cables for the video camera. Spare Firewire cables, some Firewire 400, some Firewire 400-to-800, and some Firewire 800-to-800. The USB cable for my Garmin Nuvi, and one for my husband's Garmin Nuvi. Plus power supplies for the wireless router, DSL modem, battery charger, cordless phone, printing calculator, laptops, external hard drives, printers, and so forth. I just recently added two more devices that have their own USB cable with a special connection end that fits only that device. I looked around at all the cables and cords I have lying around, and thought about how difficult it's getting to be to figure out which one is the one I need for any given device. In the past, I've taped Post-It notes to various cables to label them, but I decided to see if there were any commercial "cable labels" available that would make it easy to label my cables with something more durable than a flimsy slip of paper. I went to Amazon and did a search, and lo and behold! There's a thriving industry for cable labels, with many different styles and brands to choose from. 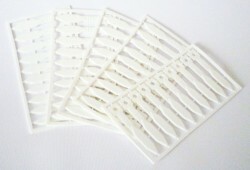 I selected the Diy Kableflags 50-pack, for two reasons: First, it's a 50-pack! That means that I can probably label all my cables and still have some left for the next few cables that enter my home. And second, they're made of rubber and don't involve adhesive, so they'll likely last longer and be more durable than the ones that are adhesive plastic or paper labels. They arrived a couple of days ago, and today I opened the package and started labeling my cables. Sure enough, these are good durable rubber items; they're not going to rip or tear. They fasten around the cable by threading one end through an opening at the other end, like a zip tie, so there's no adhesive that can dry out over time and come loose and fall off. They're a good size and design: Long enough to fit around pretty thick cables, but able to be tightened down for thin cables so that they won't come off accidentally. The part that you actually write on is a bit on the small side. Using a standard Sharpie marker, I had no trouble writing Nuvi on one, Lumix on another, and iPhone on another. But Kindle Fire wouldn't have fit; I had to shorten it to "K. Fire." On the other hand, I wouldn't want really large rubber flags attached to all my cables. That would tend to get in the way when packing cables for travel and outings. I did some experimenting and found that if I scrub hard enough, I can rub off the Sharpie ink, so that means they can be re-purposed for different cables when a device dies or gets replaced. It probably also means that over time, normal usage will start to rub off the Sharpie ink and that I'll periodically need to touch up the label so that it doesn't end up blank. I highly recommend some sort of cable-labeling system for everyone who has multiple electronic devices and numerous cables for them. If you don't like the Diy ones, there are others that are pretty darn cheap. You could also just write on a small Post-It note and tape it to the cable.